The first 24 hours of Fuelly, in statistics, originally uploaded by mathowie. Holy cow. 24 hours ago, I took the stage at the START conference and explained some of the thinking and process behind me and pb’s new site Fuelly. I knew it was an influential crowd, and I knew if it was good it might take off, but I thought maybe we’d hit 1,000 users by the end of the weekend at most. 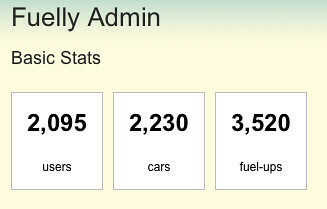 Thanks mostly to twitter and other blogs (like Lifehacker and Get Rich Slowly) it’s grown a bit faster than we expected. A cable network is doing a piece on it. Various awesome iPhone developers are wanting to plug into the API we still need to build. It’s really been a crazy 24 hours. Our inboxes are bursting with feature requests and bugs, but I’m really happy with how far we got building a site in just a few weeks. I’ll be posting a full story of the development and creation of the site on fortuito.us in a week or two when all this dies down a little, hopefully inspiring other developers to try building their own similar projects. For those of us who live outside the United States, is there any way you could build in an automated conversion from miles and gallons to kilometres and litres (or vice versa)? It’s a cool site, by the way. Yeah, we are working on that right now. We’ll offer km and L as inputs instead of mi and gallons, then add the L/100km economy measurement for everyone. Just a warning about a comment you posted on fuelly.com. You stated that one should turn his/her car off if sitting for over 30 seconds. Admittedly, I do not know a lot about electric/hybrid cars. For any regular gas operated engine, this is not sound advise. Starting you car’s engine causes 80% of the damage done to it. You may save fuel, but an engine rebuild, new starter, etc. will cost a lot more. When hearing fuel saving activities, just be mindful of the consequences/cause/effect. Not trying to argue, just inform. Infamous_ks@live.com I just joined fuelly, look for comments.